My meal plan is for a weekly delivery of 2 meals. 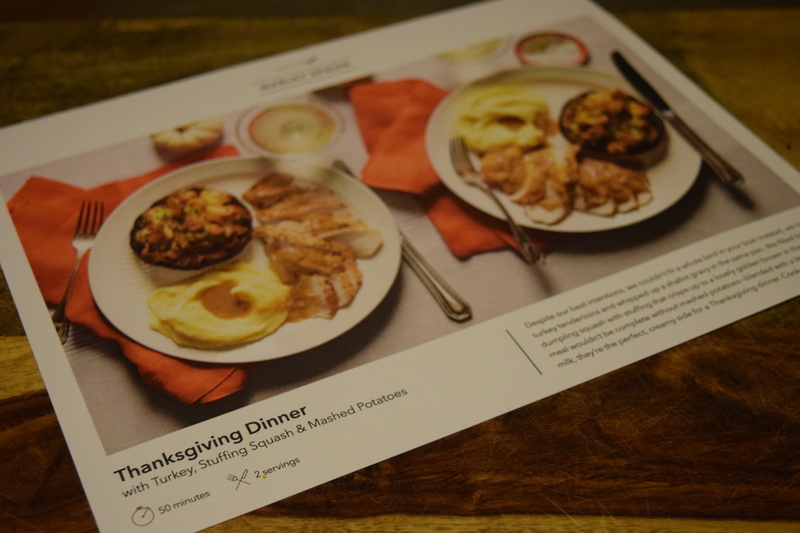 I chose this because I thought a mini Thanksgiving dinner sounded like a lot of fun. Along with this meal, Marley sent some really cute little paper napkin rings you could punch out. (I passed those along to my niece). 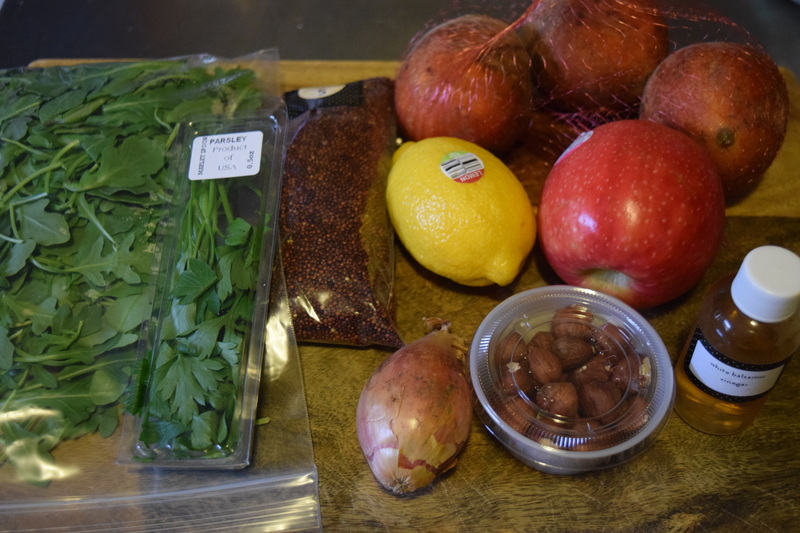 So we have a lot of ingredients this time…and a lot of steps. The big hurdle is the Acorn Squash. 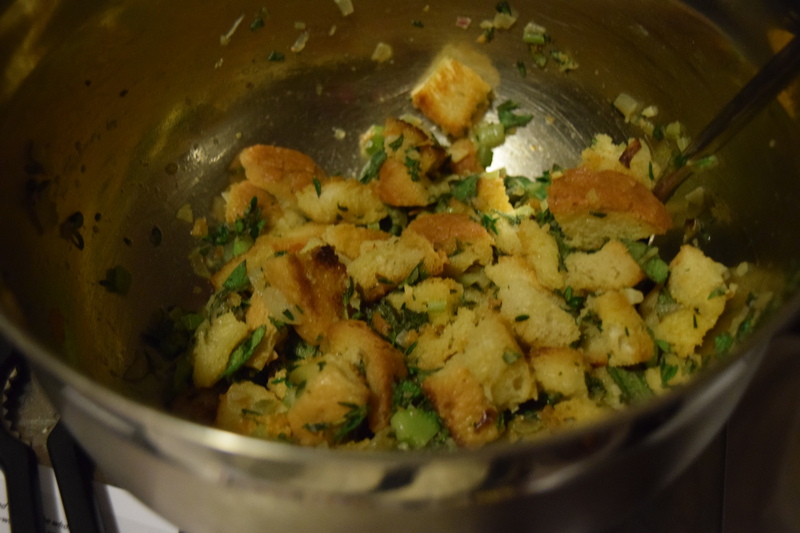 The recipe asks us to chop it in half, roast it, then create a stuffing, then stuff it, then cook it again. You need like a hatchet to bust into one of these things. I did manage to chop it without losing a digit, but I didn’t quite get it even which is problematic for roasting. 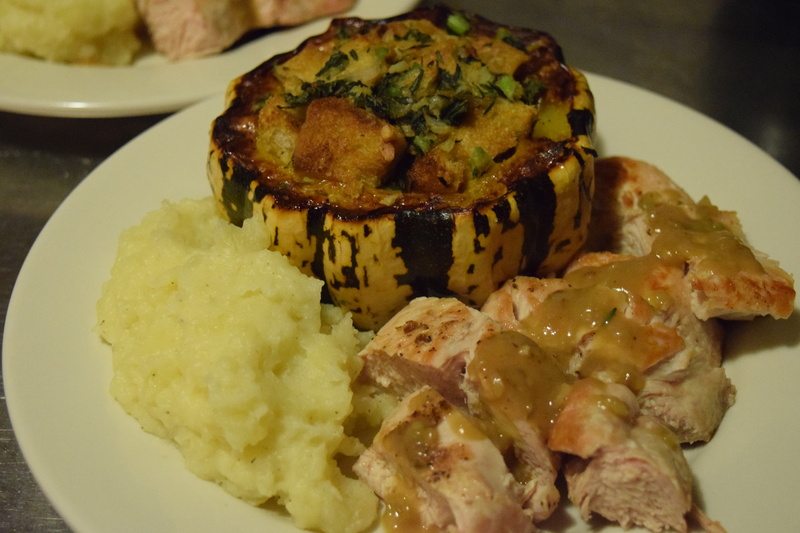 The rest of the recipe was pretty straight forward and included roasted turkey tenderloin, mashed potatoes and gravy. 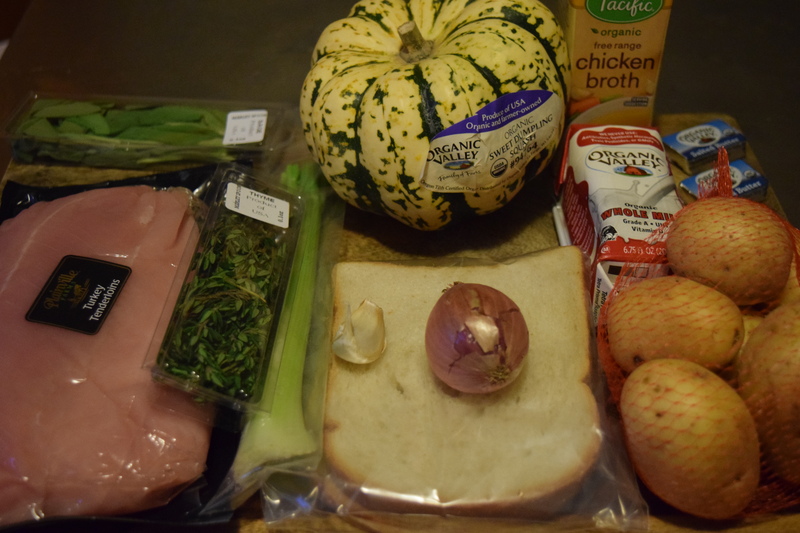 I’ve never made turkey tenderloin before, and I found it to be tasty and easy to cook, so it’s definitely something I will look for again. 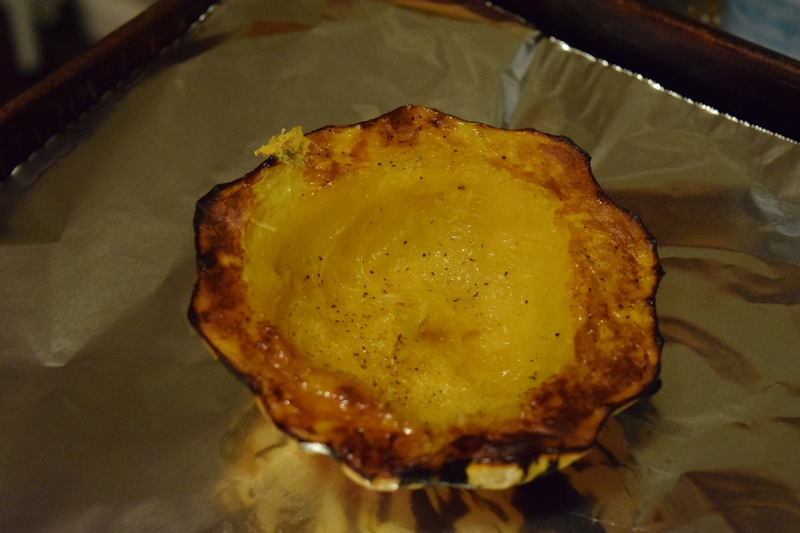 Unfortunately, the most labor intensive item, the acorn squash, wasn’t quite so great. The stuffing was really bland and I think I would have preferred them roasted with a bit of maple syrup and butter instead. The mashed potatoes tasted fine, but there’s a reason people make a giant vat of them, because it takes almost as long to make a big pot as it does a little one. And how about sending us two big potatoes instead of a bunch of little ones? They are no bueno to peel. I also found the gravy didn’t make quite as much as I wanted. I ended up using some extra chicken stock I had in the fridge in order to stretch it out a bit more. Portion Size: Generous, except for the gravy. Good for Entertaining? : Yes, with some changes. I loved the idea of making turkey tenderloin for guests and mashed potatoes are always a win. 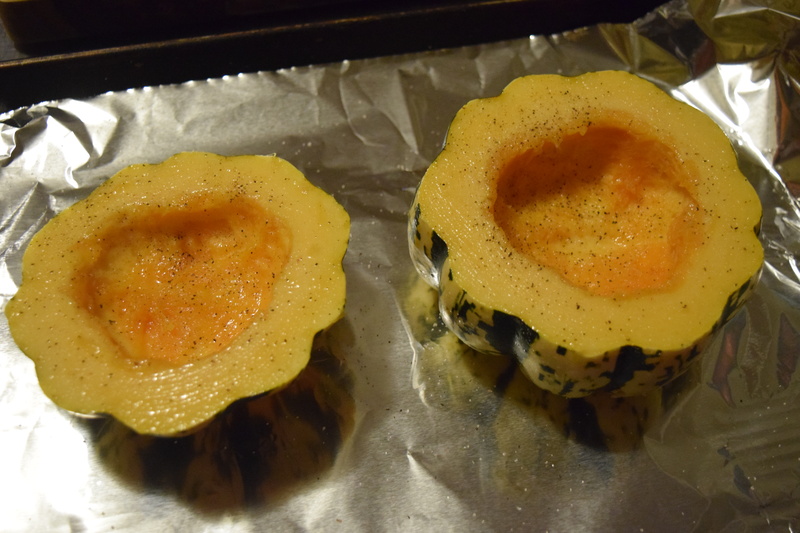 Instead of the stuffed acorn squash, I’d probably opt for a different acorn squash type dish – maybe a stuffing with acorn squash chopped inside it. I’d add on a mushroom gravy with lots of sautéed mushrooms. I’d serve white wine to drink and a pumpkin tiramisu for dessert. I chose this because I hadn’t tried Quinoa and apparently it’s like some type of magic food (after Kale and Coconut oil). 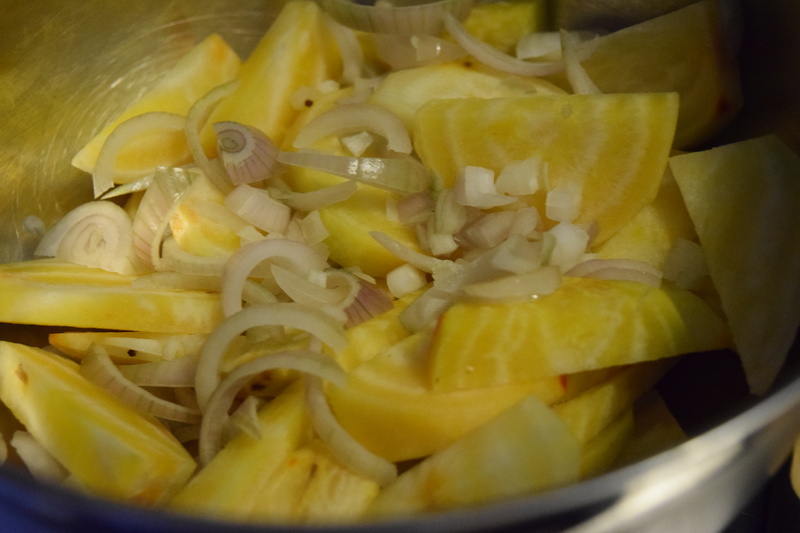 This was another fussy recipe with lots of steps. 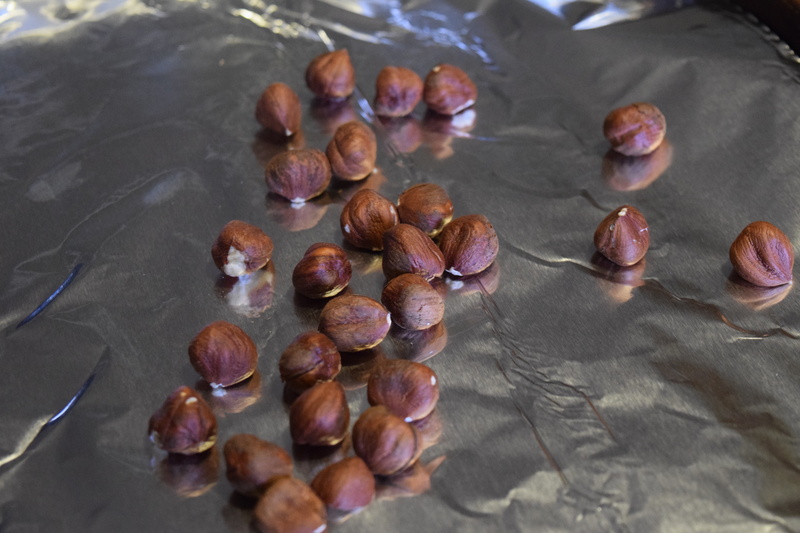 You toast hazelnuts, you roast beets, you cook quinoa, you shave cheese. There’s a lot of stuff going on. In the end though you end up with a pretty salad. I made this to take to my sister’s for Thanksgiving dinner. My contributions included a ridiculous amount of cornbread (thanks to Sylvia’s 1980s soul food cookbook) and a chocolate fudge cake with a chocolate turkey on top (as requested by my very particular niece). I figured a salad would be nice to cut through all the carbs and sugar. 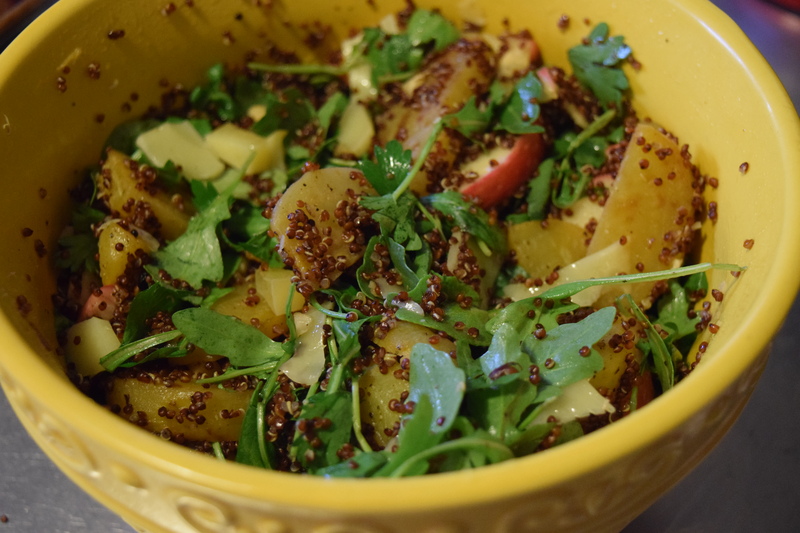 I really liked the flavors in this – particularly the beets paired with the apples, but I did not care for the texture of the quinoa. Something about it just doesn’t work for me. I also don’t really like couscous and I feel like from a texture standpoint these are similar. Portion Size: Very Generous! Way more than two portions. Good for Entertaining? : Not for me. 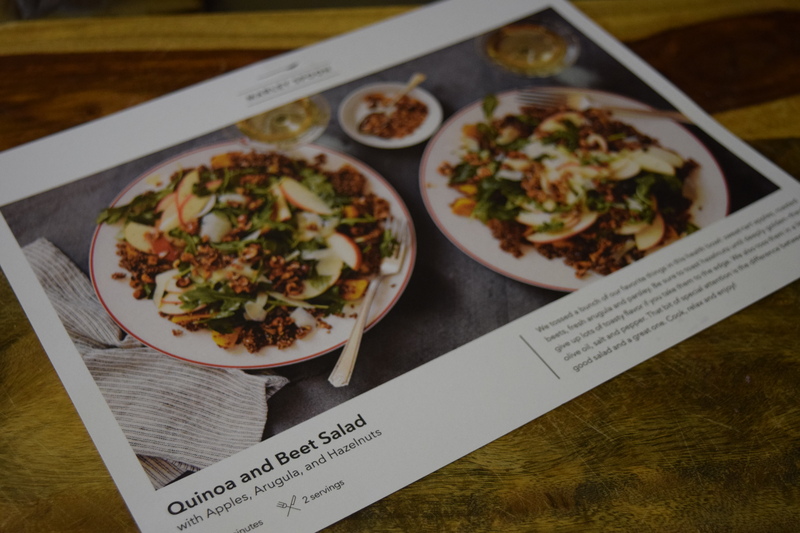 I love that Marley Spoon adjusts recipes to match the holidays and features seasonal ingredients. I thought most of the flavors were really nice, but I wish these recipes were a lot less fussy. I feel like I could have made a huge Thanksgiving Dinner in the time it took me to make two plates (with no leftovers). And isn’t half the fun of cooking a crazy Thanksgiving dinner in eating leftovers for a few days? Marley Spoon has some fun game and Valentine’s day themed recipes coming up so be sure to check back to see how those turn out. Thanks! I agree, there should always be lots and lots of extra gravy!